Milton Caniff Terry and the Pirates Daily Comic Strip Original Art dated 6-2-38 (Chicago Tribune, 1938). The artistic interaction between Milton Caniff and Noel Sickles really shows in this shadowy ink and blue wash over graphite on Bristol board daily titled "Getting Warm, Honey," and starring a scantily clad Burma. The areas of blue ink wash were used to indicate gray tone to the printer. 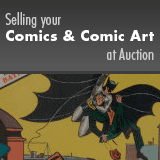 The image area measures 20" x 5.5", and the art is in Excellent condition. From A Collection of Great Cartoonists and Illustrators.